Monster Energy Yamaha Factory MXGP’s Jeremy Van Horebeek and Wilvo Yamaha Official MXGP’s duo of Jeremy Seewer and Shaun Simpson are all set for the final showdown this weekend September 30th with the twentieth and final round of the MXGP World Championship taking place at the famed Imola road-race circuit in Italy. The dust has settled on 19 rounds of the FIM Motocross World Championship and one round remains. In the premier class, MXGP, it is likely that the Championship Classification will remain unchanged, which means this weekend is all about ending the season on a high to head into the off-season motivated to come out and challenge for victories next year. Monster Energy Yamaha Factory MXGP’s Jeremy Van Horebeek is nearing the end of a chapter with Yamaha and wants to enjoy every minute he has left on his YZ450FM. After withdrawing from the MXGP of The Netherlands due to illness, the Belgian ace is feeling much better and is confident for a strong end to what has been a very challenging season. 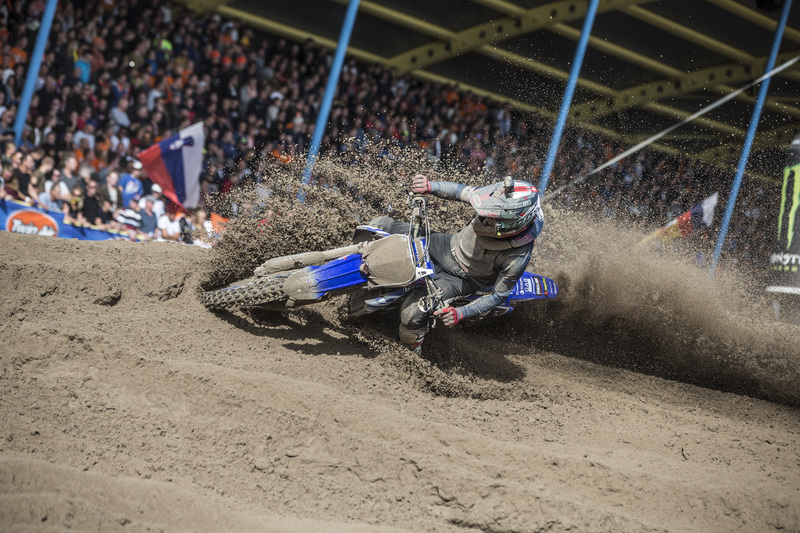 Like Van Horebeek, Wilvo Yamaha Official MXGP’s Shaun Simpson hopes for the same. The charismatic Scot enters the final round in positive spirits where he hopes to better his sixth place finish at the previous round in The Netherlands with a top-five this weekend. Also aiming for the top-five, Wilvo Yamaha’s Jeremy Seewer is always pushing to raise his level and is ready to take one last stab at achieving his season-long goal. In MX2, Kemea Yamaha Official MX2 has returned to full strength after Anthony Rodriguez dislocated his shoulder at the MXGP of The Netherlands in Assen two weeks ago. The Venezuelan would not say his shoulder is 100% but he has thoroughly enjoyed his time in Europe and wilds for time he can spend on the Kemea Yamaha YZ250F, therefore he will join his teammates Ben Watson and Jago Geerts on the gate at the final round this weekend. While positions have been more or less locked down in the MXGP and MX2 World Championships, the WMX World Title hangs by a thread. MXFonta Yamaha Official WMX’s Kiara Fontanesi will head into the final round of the Women’s Motocross World Championship this weekend with a 8-point advantage over NoFear Yamaha Official WMX’s Nancy van de Ven. For Fontanesi, the title will extend her staggering tally of gold medals to six. Should van de Ven claim the title, it will be a career milestone as her first ever. The event will kick off on Saturday 29th of September with Yamaha YZ125 bLU cRU Cup riders being the first on track. The first race of the weekend will be WMX Race 1 and that will take place at 13:35 Central European Time followed by the YZ125 bLU cRU Cup Race 1 at 15:25 and the qualifying heats for the MX2 and MXGP classes at 16:25 and 17:10. Additionally, Monster Energy Yamaha Factory MXGP’s Michele Rinaldi will join Paul Malin and Lisa Leyland on the live MXGP Studio Show at 11:00. All of the action can be viewed on www.mxgp-tv.com.